Lawmakers Say Lobbyists Often Come To Them With Proposed Language To Introduce As Their Own Bills. But Lawmakers Also Say That Can Be A Good Thing. LANSING — When news broke last month that the daughter of a Southeast Michigan towing powerhouse allegedly helped write a proposed amendment to the transportation budget, members of the public may have been surprised by such hands-on involvement by an outside interest. But many of those elected to make laws in Lansing weren’t surprised at all. They say lobbyists not only write proposed amendments to add to existing bills but they also present draft language that the lobbyists ask lawmakers to formally introduce as their own bills. Of 12 lawmakers interviewed for this story who have served in Lansing in the last five years — six Republicans and six Democrats — half said they had been asked by a lobbyist to introduce specific language. The others didn’t indicate they had been personally approached with draft language by lobbyists but said they were aware that it happens. And there is additional evidence that backs up their comments. 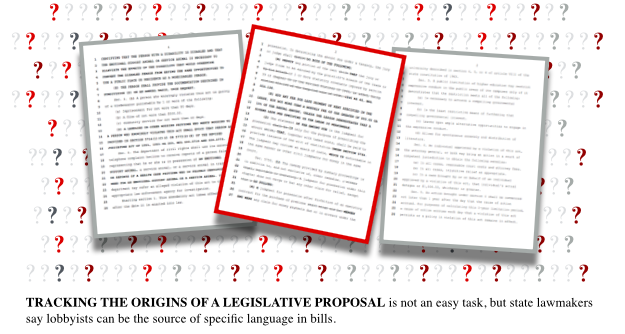 Legislative reports posted online by one interest group in Lansing make multiple references to proposals being drafted first and then lawmakers secured to formally introduce the language, second. Another potential example surfaced in December when the Detroit Free Press reported, citing federal records, that Jennifer Fiore, the daughter of Detroit towing executive Gasper Fiore, helped write a proposed amendment to the state transportation budget in 2016. The amendment wasn’t ultimately adopted. The records cited in the Free Press report were part of an ongoing corruption investigation in southeast Michigan. Most of the lawmakers interviewed for this story weren’t willing to detail their experiences and have their names attached to their stories. And most of the lawmakers also emphasized that the general involvement of lobbyists and interest groups makes for better legislation that’s vetted by those who would be most impacted by proposed changes. Rep. Robert Wittenberg, a Democrat from Huntington Woods, said he’s never been approached to introduce a specific bill. But Wittenberg said when he develops a bill, he runs it by interest groups that would be affected to get their thoughts on the proposals so they can add input and to prevent unforeseen consequences. Former state Rep. Greg MacMaster, a Republican from Kewadin, said if people denounced completely the activity of lobbyists helping write amendments or bills, it would slow the legislative process. “If you can’t count on people who are knowledgeable in the industry, then who can you count on?” he asked. Whether the language comes from a lobbyist or not, a lawmaker still has to put his or her name on the bill to introduce it, and the language still goes through the Legislative Service Bureau, which is the agency in charge of drafting bills. Different lawmakers handle requests from lobbyists differently. Some lean more heavily on the lobbyists’ proposed language while others use the requests as starting points for further research, according to lawmakers. A handful of lawmakers also described a custom in which interest groups have meetings with the chairs of policy committees before a new legislative session starts and ask the committee chairs which committee members would be best to work on the groups’ various ideas for bills. Committee chairs have the power to decide which bills will be scheduled for committee consideration. 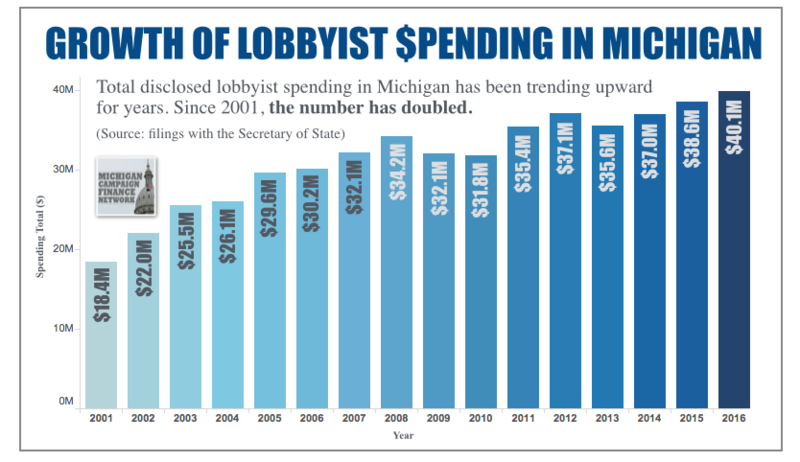 While spending on lobbying has increased in recent years, Michigan lobbyists and interest groups are often closed-mouth about the strategies they use to advance their clients’ goals in Lansing. Multiple interest groups are currently fighting to ensure they don’t have to provide certain internal communications to opponents as part of ongoing court cases. Ten interest groups, including the Michigan Chamber of Commerce and the Michigan Building Trades Council, filed a brief in one of the cases last year. The brief argued the disclosure of internal communications as part of court cases could “chill” future involvement in their organizations. 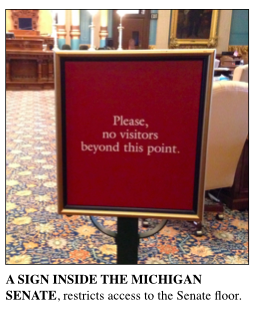 In Michigan, registered lobbyists don’t have to disclose what bills or rules they’re working to influence. 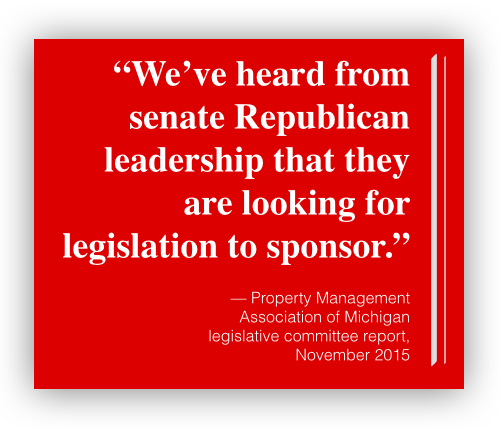 The Property Management Association of Michigan or groups that received the association’s legislative reports apparently posted reports from the association’s lobbyists and legislative committee online, which is an unusual move. The reports, going back to 2015, were visible online until recently. A report from June 2017 was visible on the association’s website as of early this week. A member of the association’s legislative committee and lobbyists who work for the multi-client firm Kelley Cawthorne, which the association employs, were responsible for some of the reports, according to the documents. The reports make references to proposed bills “we have drafted” that the lobbyists or the association were looking for lawmakers to sponsor. A March 2016 report mentioned a specific proposal and said then-Rep. Anthony Forlini, a Republican from Harrison Twp., had agreed to sponsor it. The proposal would allow fees for late payment of rent to be counted as rent by a judge in landlord-tenant legal proceedings. The association initially wanted the late fees to be capped at 20 percent of the rental amount, but Forlini preferred the cap be set at 10 percent, according to the reports. Forlini introduced the bill, HB 5767, with the lower 10 percent cap in July 2016. It didn’t advance. Forlini confirmed in an interview that the Property Management Association of Michigan brought him the idea for the bill and he worked on it. However, Forlini said he stood his ground on the 10 percent cap instead of the 20 percent cap. Multiple officials with the Property Management Association of Michigan who’ve worked on legislative issues didn’t agree to an interview for this story. But Forlini said it’s pretty common for lobbyists to bring ideas for bills to lawmakers. Similarly, he said, lobbyists will often pair the desires of an organization with a lawmaker who has similar interests. For instance, Forlini has owned rental properties himself. A June 2017 report for the Property Management Association of Michigan said “we have drafted a bill” that would make it a misdemeanor for someone to falsely claim a pet is an official emotional support animal, which landlords must allow on their properties. The June 2017 report said the organization was “discussing co-sponsorship between a Republican and Democratic senator.” In November 2017, Sen. Peter MacGregor, a Republican from Rockford, introduced Senate Bill 663, which says a landlord “shall evict” a person who falsely represents his or her need for an emotional support animal. Speaking outside the Senate chamber this week, MacGregor said multiple organizations, including the Property Management Association backed the legislation, which he said was meant to prevent people from wrongfully taking advantage of current laws on emotional support animals. MacGregor said he wasn’t sure who wrote the initial language. In addition to lobbyists asking lawmakers to introduce language, there are also organizations that circulate “model legislation” nationally. One well-known organization that does this is the pro-business American Legislative Exchange Council, or ALEC, which includes “nearly one-quarter of the country’s state legislators,” according to its website. Nine Michigan lawmakers currently serving in the Legislature have reported using their campaign funds to pay dues or event registration fees to ALEC at one time or another since 2010, according to campaign finance disclosures. Additional Michigan lawmakers could use other funds that are un-trackable to pay the costs. Organizations like ALEC circulate their preferred bill ideas from lawmakers in one state to lawmakers in other states. Model legislation is so prevalent that University of Chicago data science fellows and the Sunlight Foundation, a national organization which works to make government more transparent, tried in 2015 to create a digital tool for determining whether bills were based on models. Matthew Burgess, who was then a PhD student at the University of Michigan, was one of the fellows who worked on the project. Burgess said currently, there is no set of practices in place to expose a bill’s origins. In comparison, Burgess noted that when he writes an academic paper, he has to cite his sources. More information on the digital tool Burgess worked on for tracking model legislation is available by clicking here.